This report, compiled and edited by the Pacific Institute under contract to the Bureau of Reclamation, presents the conclusions generated by an experts workshop that evaluated a proposal to rehabilitate the Salton Sea. 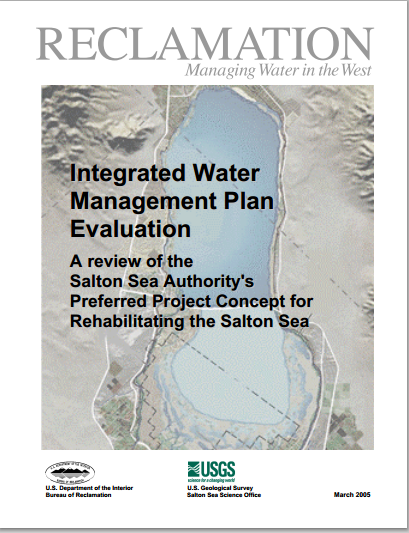 This proposal, known as the Integrated Water Management Plan for the Salton Sea (1 MB PDF) (“IWMP,” also known as the “North Lake Plan”), would divide the Sea by means of a retention structure or causeway. The northern portion of the Sea would remain an open marine environment; the southern portion would be converted to a series of constructed shallow-water impoundments, with a terminal brine pool. The problem areas highlighted by the workshop - water supply and variability; plumbing and operation of shallow wetlands in the southern basin; selenium concentration in shallow, fluctuating impoundments; and dust control - primarily center on the south basin and what will be done with the land potentially exposed by diminished lake area.The Pacific Institute and the U.S. Geological Surveys Salton Sea Science Office convened the evaluation workshop of more than twenty scientists and engineers, from November 15-17, 2004 in Riverside, California. Salton Sea’s hydology and ecosystem. The report, published in March, 2005, is available for download (1 MB PDF). More information about the Salton Sea on the Salton Sea information page.